Symantec is a pioneer of antivirus technology for computing systems. Norton by Symantec is one of the products that manage to keep up with a digital world that evolves constantly, providing an array of security products for personal and commercial use. The products allow users to explore endless possibilities in the digital domain without having to worry about threats that may cripple the system and affect your offline or online computing experience. One of the main features is the home page of the antivirus program that gives you real-time system status with color coding. All it takes is a couple of minutes for Norton to install the security software on your system. There are changes that have been made consistently over the years to the user interface that do not necessarily affect the functionality and layout of the software. If the software is up to date and all inherent systems are normal, Norton Antivirus shows a green check mark across all the major protection categories. The four main security products include Norton AntiVirus Basic, Security Standard, Security Deluxe, and Security Premium. All the products feature a similar scan and detection engine when it comes to identifying different types of viruses and malware. All antivirus products by Norton include security, identify backup, and performance monitor as the main categories. The classification makes it easy for the user to distinguish between multiple functions and navigate the software with ease. Norton AntiVirus Basic happens to be one of the best threat monitoring networks that make even the basic antivirus program a good investment. The simple UI allows you to navigate through options that defend your system against virus attacks, spyware, ransomware, malware, and other types of online threats. AntiVirus Basic is a powerful security for an affordable price of around $29.99. 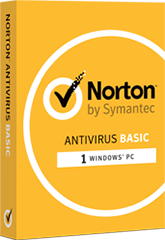 Norton AntiVirus Basic only offers protection for one Windows computer with a single purchase. However, one of the drawbacks of this product is the slow system scan that can take time and a considerable amount of system resources to function. Norton Security Standard offers complete protection for Apple, Windows, and mobile computing systems for single purchase of $39.99 approximately. The subscription offers comprehensive protection against ransomware, malware, and other virus threats. A two-way firewall is one of the many perks Norton Security Standard offers for the subscription. Excellent customer support is another reason why you can buy Security Standard over the basic antivirus. Norton Security Deluxe features real-time protection against new malware threats and intrusions, advanced security to protect personal and financial information online, and a comprehensive scan and detection engine. Deluxe goes one step forward with an easy to use web portal that allows you to manage all Norton products installed on your system. The type of computing system also determines optimum performance and most Norton products work well with 64-bit operating systems. Norton’s support is available for up to five devices across multiple platforms including Mac, Windows, and Android. A subscription for Security Deluxe is available for $54.99 approximately. Norton Security Premium is a combination of all features found in Basic, Standard, and Deluxe antivirus protection. However, you pay the premium subscription for a discounted price of $54.99 offering support of up to ten computing devices across multiple platforms for the additional features. These include premium safety features for family browsing, automatic backup for personal and financial data, and cloud storage of up to 25GB. Norton Utilities is a comprehensive tool package that allows you to keep the computing system clean and helps processes run efficiently. One-click optimization allows you to manage all processes and backgrounds tasks to configure the product for optimal use of existing resources. The features work well for computing systems that don’t have high-performance core processors and RAM modules. Norton processes can consume memory and impact system performance making utilities a must-have product to free up space and system memory. A subscription of utilities is available for $49.99 approximately. Norton Family Premier is an additional system utility that features safe web browsing tools for blocking access to inappropriate content and malicious websites. Time supervision limits the number of hours your children spend on the internet. The search supervision monitors all web browsing activity. You can subscribe to the service for under $50 approximately and avail the best family protection tools. Support is available for multiple devices and platforms. Norton Mobile Security secures all your portable devices including smartphones and tablets to be used on the go. A single subscription costs a meager $14.99 approximately. Norton WiFi privacy is another product that allows you to secure any information that you share over a public WiFi network. You can browse anonymously, avail bank-grade encryption, and access content faster with ad blocking tools. Although there can be a moderate impact on the system performance, Norton security products offer protection from online and application threats to shield your system from malicious attacks. It is a good alternative to consider among other antivirus and security solutions.